We won’t be cutting away from this one! Evil Inc’s Brad Guigar gave Saffron and Sage a review. It’s here, but behind a paywall. Spoiler Alert: Not a fan. One of the things he said that I agreed with is that I’m maybe not doing the best job explaining things. In panel five, above, is it clear that Sage is trying to shoot back? Reading it, I don’t think it actually is at all (even though I kind of like the glow anyway). This is something I’m going to work on a bit going forward, but please feel free to poke me a bit if it’s not clear what’s supposed to be happening. If your looking for criticism I’ll say to me it reads like Sage was trying to heal himself but couldn’t. It’s a little confusing because there’s no blood and you normally bleed from an arrow wound so I kind of don’t know how serious it is or if healing’s one of his powers. But I understand what happened and trust that stuff to be explained later. 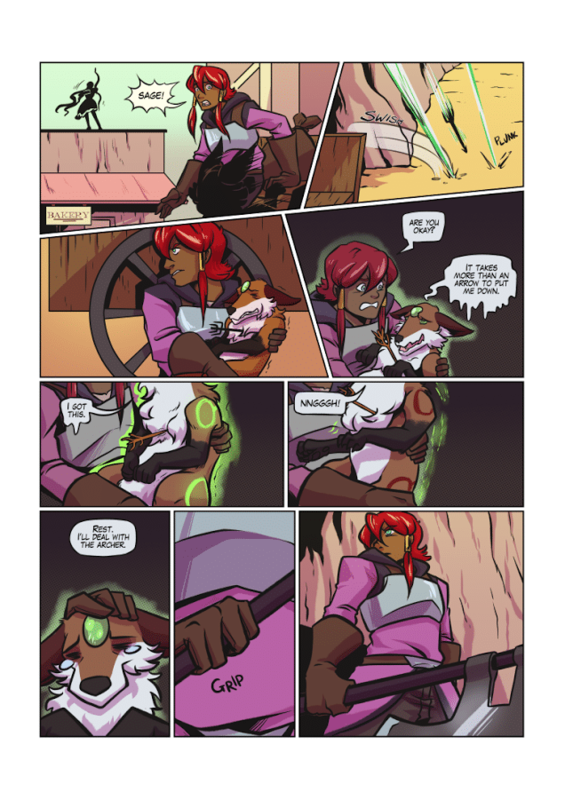 As far as the comic as a whole well….I would say Saffron’s a little weak right now. I love her character design but it’s hard to grasp her personality beyond stoic badass who likes fighting. I guess I’m waiting for a character moment like Sage’s general sarcasm or even last page when he got shot after bragging about being untouchable. Like Cassette adopting the jewels she got or forming an elaborate and unnecessary plan. Although in fairness Saffron has gotten the best page so far. I also read it as attempted healing. I think it is a matter of the ambiguity of “this”; when his previous line was about an arrow, saying he’s “got this” implies that “this” refers to the arrow stuck in him rather than the situation with the archer. Really though IMO the comic is worth reading for the cat ears joke alone. Er, I think I phrased that last sentence badly. I meant to say I have been enjoying the comic in general, but the ears joke is justification enough for reading on its own.